Use cases are meant to describe what happens between system and environment. Use cases were first introduced by Ivar Jacobson before becoming part of standard UML. Their aim is to describe how systems under consideration are expected to support the execution of specific business scenarii. Due to their simplicity and versatility, use cases are widely used to express system requirements. “Actors” are placeholders for agents performing their role in the scenario considered. Ovals stand for the activities supported by systems. Interactions are figured by arrows meant to support communication of events or data. Use Cases describe system roles in business scenarii. Triggering conditions: Use cases are triggered by a single event possibly qualified by prerequisite state of business objects. As a corollary, there is a distinction between primary roles, source of triggering events, and secondary ones which can be prompted for participation. Extension points mark alternatives along execution paths. They are associated with rules. Post-conditions on the state of business objects after normal completion. Pre- and post-conditions are described by rules. 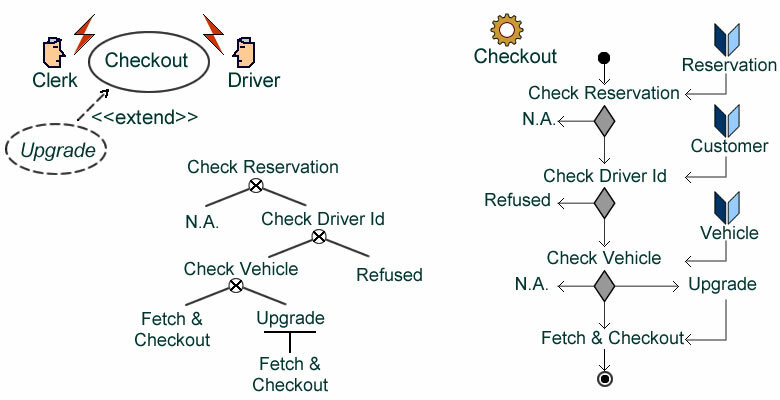 Use cases may also be documented with other UML diagrams focusing on activities, transient objects and messages, participants and collaboration, and dialog states. Since use cases are often employed well beyond requirements, it must be reminded that they must remain “black-boxes” and what will happen within the system is off-limits. That may be easier said than done, especially when architectures are not finalized or systems are distributed. That difficulty may be overcome with use case patterns designed along a model driven engineering perspective. When specifying the details of use cases it may be tempting to bridge the gap towards analysis and introduce system oriented formalisms like sequence or class diagrams. That should be avoided as it would blur the semantics as well as the responsibilities. Nonetheless, some common language has to be found if artifacts further down the development path are to be traced back to requirements. That can be achieved if a clear-cut distinction is made between functional units and detailed specifications. Functional units identify business objects and processes on one hand, their symbolic representation as system objects on the other hand. Detailed specifications are expressed using the specific languages of business domains under consideration. One persistency unit, two execution units, two roles, two specific languages. Agile methods often prefer user stories to use cases as the tool of choice for requirements capture. Whereas respective outcomes are similar, processes do differ as use cases focus at once on interactions between agents and systems while user stories introduce them along the course of refinements. As a corollary, the former approach is at its best when new functionalities are to be added to existing systems, the latter more suited to standalone applications. Yet, user stories may also be helpful to single out the main success scenario of use cases. Use cases can seldom be defined individually as shared functionalities are factored out and optional ones set apart. Standard UML provides <<include>> and <<extend>> relationships respectively for shared and optional use cases. Convincing can be described as an optional or shared use case. Yet, it must be reminded that all execution paths are meant to be triggered by a single event. As a consequence, whereas included or extension use cases can initiate interactions with specific roles, they cannot be triggered by them. Apparently, the same shared and optional activities could be expressed using generalization, with base use cases obtained by factoring out activities to be included by all execution paths. Yet, since the constraint about unicity of triggering event remains, primary roles of sub-cases, if any, must also be sub-roles of the base primary role. In other words users cannot communicate across abstraction levels but must collaborate directly. Given the lack of consensus about use case generalization, <> and <> relationships should be used whenever possible. When collaboration involves use cases supported by other systems, they may be represented by services (see below). Interaction flows are defined within a single application domain, under a single authority. Objects from different business domains must be associated with explicit symbolic descriptions. 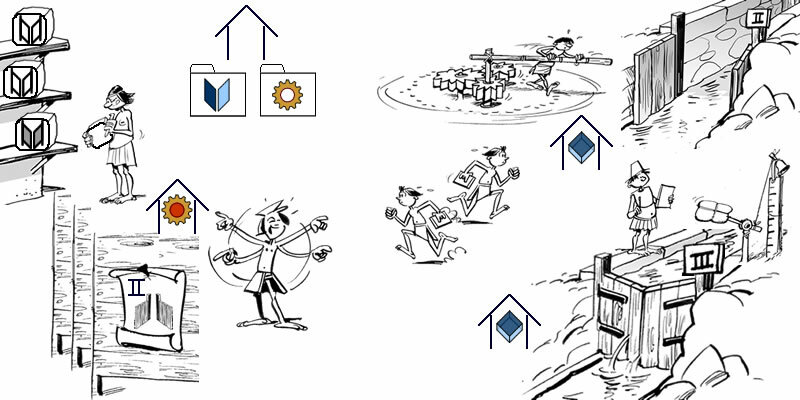 Use cases execution must be controlled within a single location, namely, under a single clock and with all symbolic objects available without delay. Use cases can include distributed entry points providing no shared processing is involved and platform specifics are kept separate. Use cases perimeter must be set by physical and symbolic containers. Whereas business and application domains can be set independently of platforms, that is not the case with entry points. The difficulty is therefore to specify use cases without implicit assumptions regarding technical environments. Platform independent use cases could be obtained by trimming off all specifications depending on platform. Such use cases would be limited to functional interactions and could not be instantiated. The alternative solution would be to define concrete use cases specific to platforms, which would include a single concrete functional use case. Ideally the latter would be described as a service. It’s worth to be noted that none of those solutions neatly fit into the MDA framework of CIMs, PIMs, and PSMs. As part of requirements use cases appear before models could be properly layered, with parts clearly belonging to CIMs while others often platform dependent. This apparent mismatch illustrates the basic modeling alternative between abstraction and delegation. When aligned with architectural tiers (presentation, application, persistency), use cases can be described with <<include>> and <<extend>> connectors. Alternatively, if use cases are aligned with model layers (CIMs, PIMs, PSMs), they are best described with generalization and inheritance. It must be noted that the choice of a modeling perspective will shape the description of variants: business driven (along model layers), or platform driven (along architectural tiers). “Abstraction” refers both to a modeling activity (singling out a subset of features) and to its outcome (a partial description of which there can be no actual instance). More formally (see abstraction layers), abstract artifacts are descriptions without extension, contrary to concrete ones, for which actual occurrences can be identified. Checkout is concrete, instant upgrade is abstract and can only be instantiated when no other vehicle is available. Yet, use cases are not to be confused with the classes which realize them; they don’t describe objects but phenomena, more precisely execution paths segmented by extension points. Accordingly, abstract use cases are activity descriptions which can’t be executed on their own. In other words abstract use cases have no path to be fully instantiated, i.e from start to completion. As a corollary, inheritance cannot be used for flows, only for activities. Instantiation is a matter of organization. It applies to the specification of execution paths, namely the full description of what may happen between use case triggering and completion. With that understanding, abstract use cases don’t have fully specified paths. Realization is a matter of system functionalities. It applies to the allocation of activities, namely how system functional components will support use case execution. With that understanding, abstract use cases left some activities without support. Whereas both interpretations may eventually coincide, they must be mapped with the two modeling strategies mentioned above. 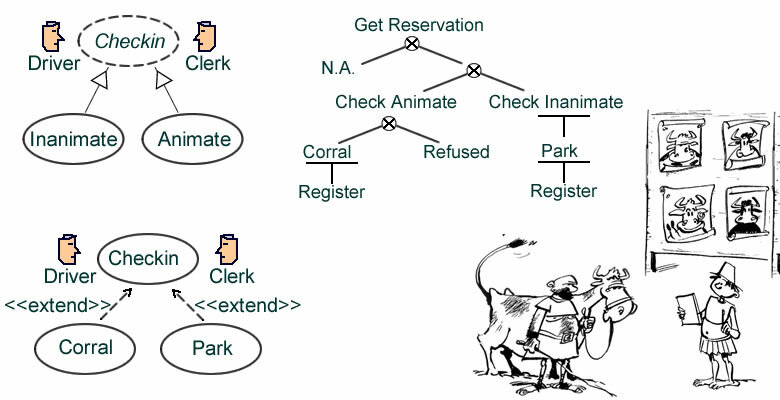 While roles (aka “actors” in UML parlance) are initially defined by business organization, they can also be associated with system entry points as soon as use cases realization is considered. If platform specifics are to be kept separate, roles must be defined solely by organization, independently of actual contexts. <<include>> would target roles associated with cross responsibilities set in different business contexts. <<extend>> would target specific responsibilities. Generalization could provide an alternative formalism with the same semantics. If upgrades are to be performed independently as well as within check-out, manager’s responsibilities must be defined as an extension of clerk’s ones. It must be reminded that, since roles are meant to describe parts played by agents interacting with systems, they cannot stand for organizational units or any collective agents. Yet, they may stand for systems representing organizational units, e.g messenger service. Structure partitions target persistency units. If execution units are properly defined, object status can be evaluated upfront. 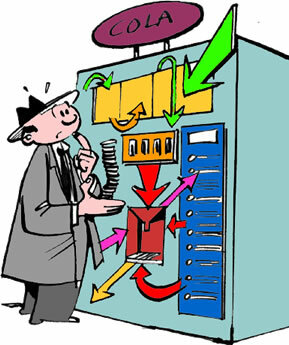 Control partitions target execution units and their status is meant to change along execution paths. Structure partitions are set, control partitions may change. Use cases deal with interactions between system and users, activities deal with processing rules. They belong to requirements, are specific, and are tailored for development purposes. Activity diagrams belong to business process, are introduced for management purposes, and not bound to specific applications. Use cases are populated with selected paths from activities. Use cases see systems as black-boxes: they may pick activity descriptions from business processes but should not define them anew based upon interaction constraints. Execution units should be defined independently of platform specificities, and consequently of technical constraints on interactions, ie use cases. Since activity diagrams deal with logical flows and use case diagrams with execution paths, they overlap but don’t coincide. In other words, the rationale of end users applications (as defined by use cases diagrams) is not necessarily based on business rules (as set by activity diagrams). It’s worth to note that those guidelines will greatly help to map use cases into model layers as set by model driven engineering. Use cases describe interactions in terms of roles, events, and flows between systems and contexts. System functional components are off-limits, to be introduced at the next stage when use cases realization is considered. Functionalities already supported by existing systems (aka services) are modeled as actors. They may refer to activities as defined by business rules. Whereas they cannot shortcut activities by directly referencing persistency units, symbolic objects (persistent or transient) may be attached to flows with actors. 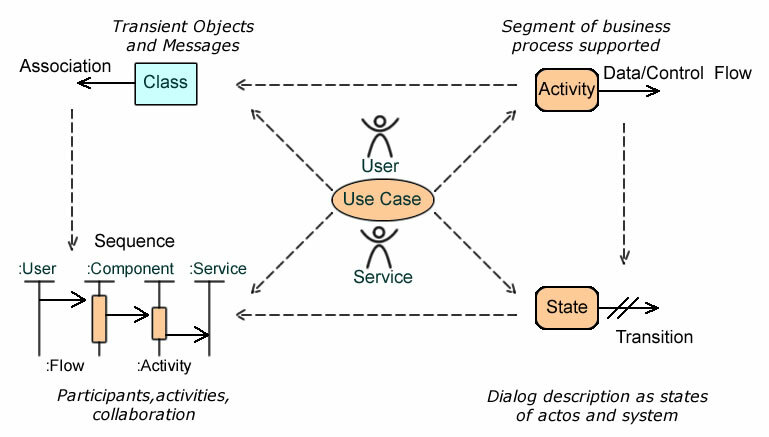 Criss-crossings between use cases and persistency units may be taken one step further using the aspect-oriented paradigm, which introduces a level of indirection representing objects as accessed by activities. Whereas aspects (aka facets) may be very similar to views, that could be misleading since aspects are dual descriptions built from use cases as well as objects perspective. When combined with object oriented paradigm, aspects can be detailed by use cases before being consolidated into functional architecture over the course of system analysis. Looking through system veils one should identify the symbolic objects that will take charge. Then describe how they will collaborate to fulfill user requests. Boundaries are standalone (not shared) active components realizing interactions with actual objects. Controls are shared active components realizing transient symbolic objects. Entities are shared passive components realizing persistent symbolic objects. 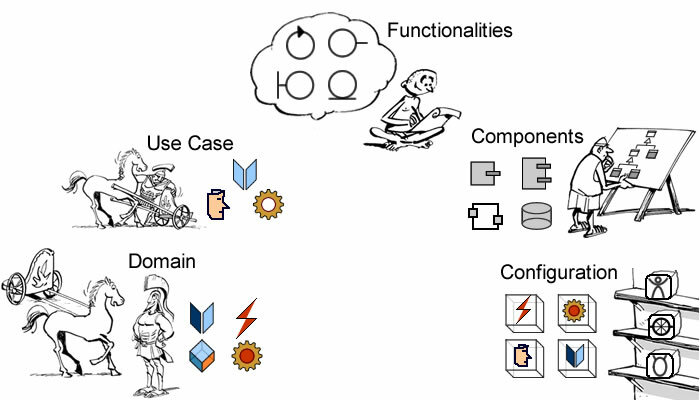 Services are shared active components realizing the roles of external symbolic systems. “» Flows of data or events describe the interactions.”—(From the System to Actor and Actor to System) is a good clarification of what interactions are or should be. Some professionals also include Activities of System and Actors, which actually complicates Use Case Description. “» Use cases are blackboxes:”—According to the above, Use Cases are “Flows of data or events…” which too independently hold and accept BUT ARE NOT BLACKBOXES. You can say the SYSTEM IS BLACKBOX. Also Actor is also a BLACKBOX since the internal thinging / processes need not be known / specified. I appreciate some interpretations and explanations since I arrived at them myself after some study, analysis and use.